Raees is an upcoming 2016 Bollywood crime-drama film directed by Rahul Dholakia and produced by Gauri Khan, Ritesh Sidhwani and Farhan Akhtar under their banners Red Chillies Entertainment and Excel Entertainment. Shah Rukh Khan, Nawazuddin Siddiqui and Mahira Khan are in the lead roles. Raees will be released on 17 Jan, 2016, three days before Eid. Mahira Khan is playimg lead female role in this film. She is a Pakistani actress. The film is set in 1980s Gujarat. 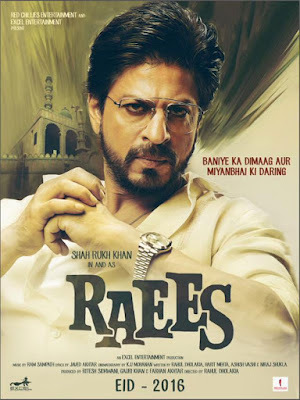 It tells the story of the eponymous bootlegger Raees Khan (Shahrukh Khan) whose business is highly challenged and eventually thwarted by a police officer (Nawazuddin Siddiqui). The trailer of this film has released now. Trailer is amazing. Some hard hitting dialogues are delivered by both actor Shahrukh & Nawazuddin. Some dialogues are amazing. So fans are so excited for this film. 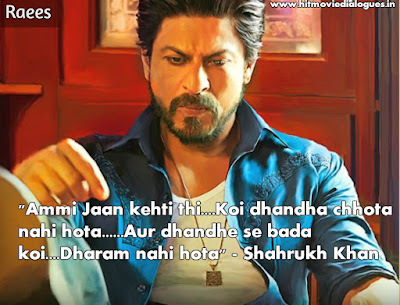 Here I have collected some best dialogues of Raees film. I hope, You will like my post. "Jayda uncha mat udd....kat jayegaa"
"Ek din nak mein nakel dal ke...Khinch ke leke jaunga tujhe main yahn se"